If we've missed anything or if you would like to let us know about any upcoming events, please use the contact form above. We in the food business all have our obsessions, whether they be cheese, or soil or Dolcetto grapes, but our dear Derek has a borderline-unhealthy obsession with white wines from Germany and Austria. While other delicious grapes of note reside in these countries, he is most especially particular about Riesling and Gruner Veltliner. Derek and Julie spent their honeymoon travelling through these countries, sipping wine at every turn, and want to share what they learned on their trip. Have you ever gazed upon a small mountain of shredded cheddar cheese, quaking with excitement at the gustatory challenge it presents and trembling with fear that your victory may ultimately be a Pyrrhic one? No? Well I have, and it has changed me forever, and for the better. My wife, daughter and I are in Cincinnati, OH for a couple weeks, and of course no trip here would be complete without at least one meal at Skyline Chili. 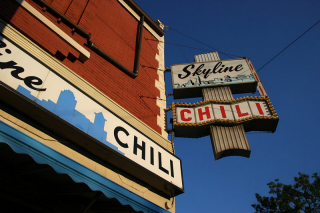 For those of you ignorant of Midwestern fast food, Skyline Chili is a Cincinnati phenomenon, famous for their 3, 4 and 5-way chilis and chili-topped coneys (hot dogs). Everything comes topped with a heaping mound of cheddar. What's your favorite cheese to cook with? Gruyère is my favorite. Supreme meltability combined with a deep nutty flavor. Perfect for grilled cheese sandwiches, fondues, you name it! What's your favorite cheese to cook with, and what do you do with it? Rob Kaufelt, proprietor of Murray's Cheese and co-author of the Murray's Cheese Handbook, will be on The Leonard Lopate Show on New York Public Radio, discussing French vs American cheeses with Leonard, Ruth Reichl and Anne Saxelby. Think tradition vs Whim. May the best curd win. Listen on Tuesday July 17th at noon or check the WNYC website for webcasts, podcasts and syndicated times. UPDATE: The show was great, very informative and enjoyable to listen to. The only problem was that they hardly got a chance to talk about the cheeses themselves! Here's a link to download the entire segment (34 minutes long) from WNYC. Celebrate Bastille Day this year by indulging in a great summer selection of French cheese and wine and learning all about the history of this revolutionary holiday. Join our Fromagère and Sommelier for a night of tasting, stories, and revolution! Next Sunday through Tuesday the Fancy Food Show hits New York's for three days of specialty food revelry. Well, to counter all the mass market mayhem, Grocery Guy Tom Mylan and Sasha Davies, co-founder of Cheese By Hand, are organizing the first ever Unfancy Food Show in Williamsburg, Brooklyn. The small fair will be held in the backyard of the East River Bar, and will feature local and artisanal producers including top Vermont cheesemakers Jasper Hill Farm and Consider Bardwell Farm. Other folks scheduled to appear are Jessica Applestone of Fleisher's Grass Fed Meats, Brooklyn's Gorilla Coffee, In Pursuit of Tea, Roger Repohl of Bronx honey fame, Jon from Wheelhouse Pickles, Taza Stone Ground Chocolate, and more! Sounds like a fun, tasty way to spend a day, and a great way to support local producers crafting truly "specialty" foods. 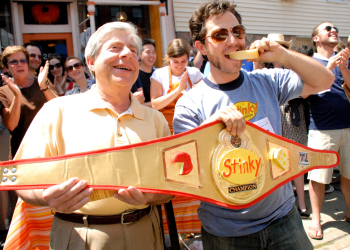 This is the first installment of a new feature here on Curdnerds, where we list the week's upcoming cheese-related classes and other events throughout the U.S. If we've missed anything or if you would like to let us know about any upcoming events, please use the contact form above. Sampling 5 Star Spangled American Summer Beers: Spanish Peaks Summer White, Wachusett Summer, Blue Point Summer, Smuttynose Summer Weizen, Southern Tier Hop Sun. Paired with 5 Home of the Brave American Artisanal Cheeses: Boggy Meadow Fiddlehead Tomme, Rogue Morimoto Soba Cheddar, Vella Monterey Jack Dry Reserve, Fiscalini San Joaquin Gold, Carr Valley Cave Aged Marisa. Reservations: Please arrive by 6:30pm, seating is "first come, first served." The latest issue of Cravings, a monthly online magazine dedicated to the New York City food scene, has a nice series of articles on cheese and on Max McCalman, Maître Fromager at Artisanal Fromagerie. There's a Q&A with Max, as well as a short guide to pairing cheese with various different beverages.